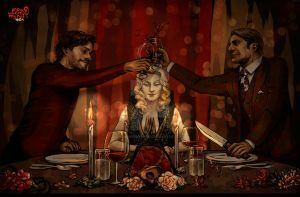 For the Banquet Hannibal artbook! I like how you've incorporated this with the last supper! Truly amazing art! Thank you so much! Betrayal at the dinner table seemed very apt for Hannibal. and the Da Vinci code takes on a different course! Awesome Piece man! It's funny that they all betrayed him at one point! Ahh this is very true sir! This has to be one of my favorite pieces that's used The Last Supper for inspiration.